Hello hockey fans! We're back with another update for this season's Plus/Minus Arena Report. We want to keep you up to speed again this season on arena and franchise changes in the world of North American college, pro, and junior hockey. This time we focus on outdoor games as the cold weather will be here soon and outdoor games will be taking place within the next few weeks. Some of the venues listed here are home of regular or annual events, whereas others will end up being one-off affairs. Hopefully you can use this information to take in a new hockey arena, (or in this case stadium) this season. Bundle up if you do as outdoor hockey can be frigid but fun. Here is a list of outdoor venues where fans can watch some hockey this Winter. Junge Ice Rink and Pavilion Bryn Athyn, Pennsylvania. Bryn Athyn College moves up to NCAA D3 this season after being in the ACHA for a while. 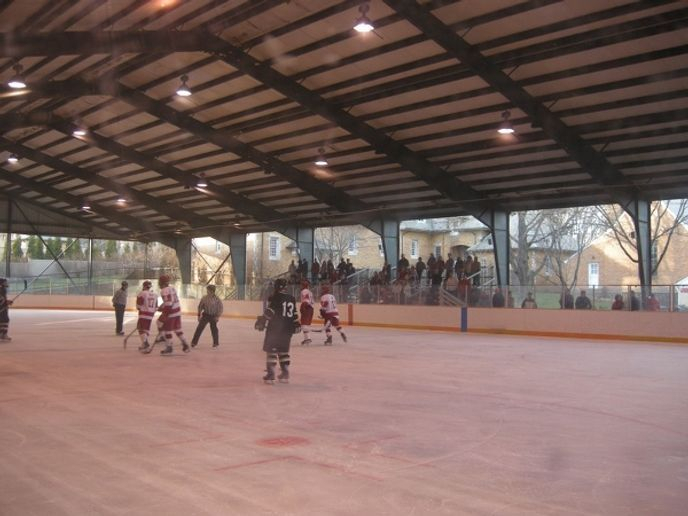 Their on campus venue has a roof but no walls and is an open-air rink which could be considered outdoors. Some folks were aware of this place for a while, but we wanted to make note for our readers. Home games start December 1st at this suburban Philly location. Buffalo RiverWorks Buffalo, New York. The University at Buffalo Bulls will again have an outdoor game at this downtown open-air rink, with this season's game taking place December 3rd against RIT's ACHA team. TD Place Stadium Ottawa, Ontario. The NHL's outdoor season kicks off here, in the venue that is essentially part of TD Place Arena, home of the Ottawa 67's. 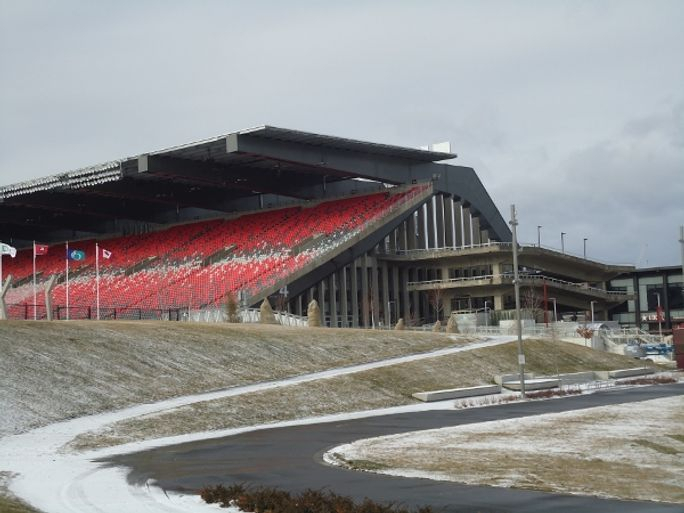 The Sens and Canadiens will battle in this CFL stadium, which is also adjacent to the Aberdeen Pavilion, the oldest structure still standing which hosted a Stanley Cup Final, having held the title in 1904, long before there was even a NHL. Del Mar Arena Del Mar, California. The Mountain West hockey League will see semi-pro hockey take place outdoors at the famed Del Mar Fairgrounds as the San Diego Skates take on the Orange County Checkers on December 17th. The venue will see college action the next day as San Diego State's ACHA team takes on Cal State Long Beach. New Era Field Orchard Park, New York. In the most meaningful outdoor game ever Canada will take on the USA in World Junior action at the home of the Buffalo Bills on December 29th. We hope it turns out well, but playing a game of this magnitude on what may likely be sub-par ice conditions is something we are not crazy about. Look for lots of Canadian fans to fill the stadium with its proximity to Ontario. Citi Field Queens, New York. While outdoor hockey is taking place in Buffalo a couple days before, the Sabres will be at the home of the Mets to take on The New York Rangers on New Years Day in this NHL matchup. Hersheypark Stadium Hershey, Pennsylvania. The most famous market in all of minor league hockey will take its second crack at hosting outdoor hockey on January 20th as the Bears host the Lehigh Valley Phantoms. The place was packed for the first game in 2013. The ice will stay up for a bit and Lebanon Valley College will see their NCAA team play here on January 27th for those wishing to avoid the big crowd but still attend a game here. Victor-Pepin Outdoor Rink Drummondville, Quebec. 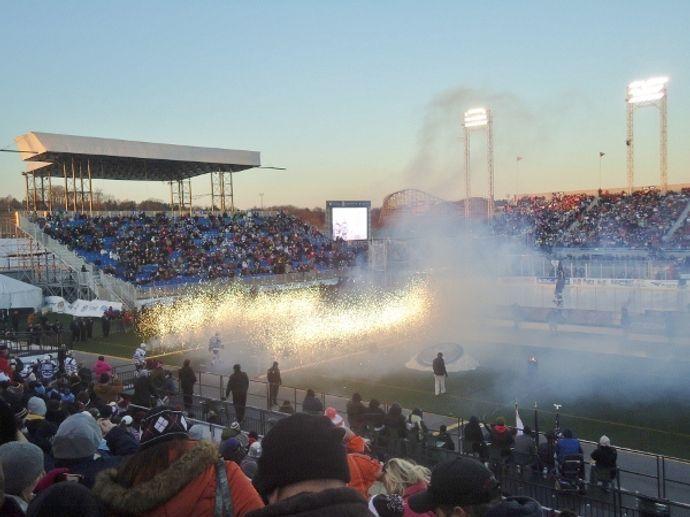 The QMJHL will have another "Classique Hivernale", this time in Drummondville on February 9th and 10th and the Voltigeurs will play a pair of games on the city's outdoor rink with plans to assemble 6000 temporary seats for fans to see the action. It is cold in Quebec in February, so this could be quite the experience. Mosaic Stadium Regina, Saskatchewan. Mosaic Stadium becomes the second CFL stadium to host outdoor hockey this season as the WHL's Regina Pats celebrate 100 years of hockey with a pair of games on February 17th and 18th. Navy-Marine Corps Memorial Stadium Annapolis, Maryland. The Washington Capitals will take on the Maple Leafs at the home of Navy Football in a late season (for outdoor hockey) game on March 3rd. The military backdrop will make for an interesting setting for NHL hockey. This is a recap of the outdoor games we are aware of. There may be some more outdoor games out there this season that we could not find information on yet. There is no Frozen Fenway this season, and there may be outdoor games at lower levels such as the annual Lehigh Valley Winter Classic for Lehigh University's ACHA team, or the USPHL's Chicago Cougars game which has taken place a couple times, but we wanted to get a list of outdoor games out to you, the readers, from games we can confirm as outdoor hockey season will be here soon. Grab your thermal underwear and some gloves and hit an outdoor game this season. Although the hockey itself is often not the best the experience is usually a memorable one.